What do you do with this 1099-MISC form? What taxes do you owe on this income? 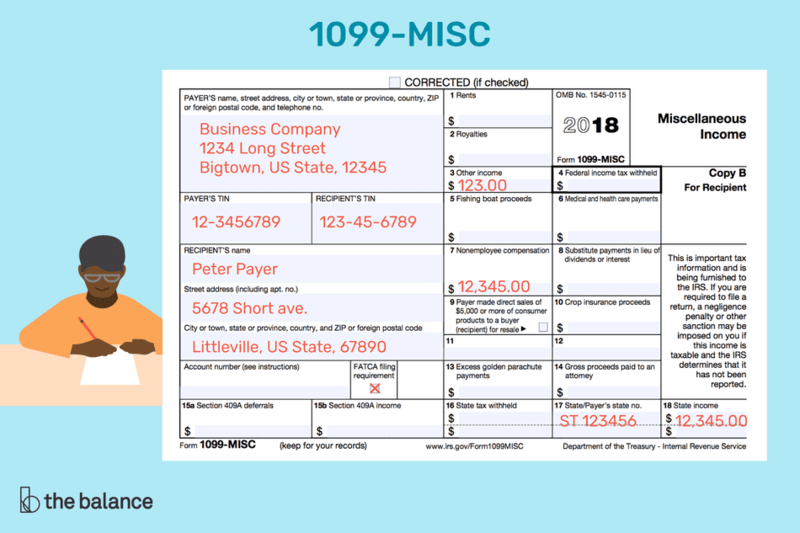 A 1099-MISC form is used to report amounts paid to non-employees (independent contractors and other businesses to whom payments are made). Non-employees receive a 1099-MISC each year at the same time as employees receive W-2 forms—that is, at the end of January—so the information can be included in the recipient's income tax return. If you are doing your own tax return using a tax software program, you will be asked if you have any 1099 income. At this point, you can include the information from the form you received. If you are having a tax preparer do your personal return, give the form to your preparer along with your other documents. Every US taxpayer must pay Social Security and Medicare taxes on his or her income. For self-employed individuals, these taxes are called self-employment taxes. Self-employment taxes are calculated on the individual's federal income tax return based on the net income from the business. How you report 1099-MISC income on your income tax return depends on the type of business you own. If you are a sole proprietor or single-member LLC owner, you report 1099 income on Schedule C—Profit or Loss From Business. When you complete Schedule C you report all business income and expenses. Reporting business expenses—such as fees paid to professionals, purchases of business supplies or equipment, and business office expenses—reduce the net income from your business. The net income from your Schedule C is included on Line 12 of your personal income tax return along with all other sources of income, including income as an employee and investment income. Your personal income taxes are determined by your total adjusted gross income. If your business is a partnership, multiple-member LLC, or corporation, your 1099 income is reported as part of your business income tax return. Why aren't taxes taken out of my 1099-MISC income? Employers are not required to withhold federal income taxes from non-employees, except in specific circumstances, such as backup withholding (discussed later). Employers also do not withhold Social Security and Medicare taxes from non-employees. Do you have to pay self-employment taxes on 1099 income if you have FICA taxes withheld from employment income? Yes, if you have 1099 income you are considered to be self-employed, and you will need to pay self-employment taxes (Social Security and Medicare taxes) on this income. This is true even if you don't file a Schedule C.
Social Security taxable wages are capped at a maximum each year. First, wages from employment are considered, then self-employment income, until the annual maximum taxable income level is reached. There is no maximum on Medicare taxes, so all employment and self-employment income is subject to Medicare tax. In most cases, no federal income taxes are withheld from non-employees. But there is one circumstance in which the IRS requires backup withholding: If the non-employee has not provided a taxpayer ID number or if the taxpayer ID is missing or invalid, the IRS sends a notice to the payee requiring that backup withholding begin. All income must be reported to the IRS and taxes must be paid on all income. The payee may have forgotten to prepare and submit a 1099-MISC form for the income paid to you. Most likely, the payee may not have paid you $600 or more in a calendar year, in which case, no 1099-MISC must be filed with the IRS and provided to the worker. If you receive payments from several payees, you may or may not have a 1099-MISC form to match all payments, but you must still report and pay taxes on all 1099 income each year. For more information on 1099 income, see this IRS article on Reporting Miscellaneous Income. If you don't consider yourself self-employed, how you report this income on your personal tax return depends on where it is located on the 1099-MISC form. If the income is reported in Box 3, Other Income, include the information on this 1099-MISC on Line 21, Other Income. If your 1099-MISC income has been reported in Box 7, Non-Employee Income, also report this income on Line 21 of your personal tax return. If you are not an employee of the payer, and you are not in a self-employed trade or business, you should report the income on line 21 of Form 1040 and any expenses on Schedule A (Form 1040) (PDF), Itemized Deductions.